LOUISVILLE, Ky. - Includes notes via the PGA of America. There was a rain delay early Friday morning at Valhalla Golf Club. Play resumed at 8:35 a.m. Tee times have been moved back about an hour. Stormy weather is expected throughout the day. 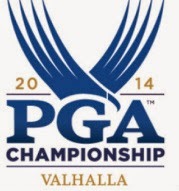 Valhalla measures 7,328 yards for the second round. Despite a wet golf course, lift, clean and place is not in effect at this point. Ben Crane withdrew because of a back problem. He shot a 74 in the first round. A total of 53 players finished the opening round under par. By comparison, 51 players were under par after the first round in the 1996 PGA Championship at Valhalla; 21 were below par through one round of the 2000 PGA Championship at Valhalla. Good scoring was on display in the first round, with those 53 rounds under par. Kevin Chappell (65), Jim Furyk (66), Chris Wood (66) and Shawn Stefani (68) were the only four who did not have a bogey or worse on their scorecards. Four weeks before he turns 65, United States Ryder Cup Captain Tom Watson parred the first 15 holes in the opening round. Watson, who won the 2011 Senior PGA Championship at Valhalla, made bogey at No. 16 but parred his final two holes for 72. Entering this week, Watson ranked second in scoring average among those who have played 100-plus rounds in the PGA Championship – Jack Nicklaus, 71.37 scoring average (128 rounds); Watson: 71.72 scoring average (114 rounds). Kentucky natives J.B. Holmes and Kenny Perry have gotten a lot of local love this week. Today, Holmes had six birdies and shot 3-under-par 69. He is tied for 11th. Perry, who received a special exemption to play in what is likely his final PGA Tour event, had three birdies but also four bogeys and is tied for 78th place after shooting 72. Both Holmes and Perry represented the victorious United States Team in the 2008 Ryder Cup at Valhalla.